Approximately 9 out of 10 adults experience back pain during their lives, making it one of the leading reasons for doctor visits. Back pain that comes on suddenly and lasts less than 12 weeks is referred to as "acute," which can be caused by a fall or heavy lifting. Back pain lasting more than 12 weeks (chronic) is less common. Pain doesn't always develop immediately following an injury because the body is good at adapting to strains and stress. However, the injured area will cause strain to build up over time and eventually symptoms will develop. That is why injuries from the past can still cause current pain. Cellular regenerative procedures, such as Platelet-rich plasma (PRP), Prolotherapy, and Stem Cell Therapy, help to heal soft tissue, such as tendons, ligaments, and cartilage, that are normally slow to heal. They can strengthen the connecting tissues to make the spinal column more stable, allowing manipulation treatments to retain their healthy adjustments. Muscle or ligament strain. Injury occurs when these tissues are over-stretched or torn, resulting in damage to the muscle or ligament fibers (tough, fibrous tissues that connect the bones together). A strain that occurs in the lumbar region of the back is referred to as a lumbar sprain. When the muscles or ligaments in the low back are strained or torn, the area around the muscles will usually become inflamed. The inflammation leads to back spasm, and it is the back spasm that can cause both severe lower back pain and difficulty moving. Bulging or ruptured discs. Discs act as cushions between the bones (vertebrae) in the spine. The soft material inside a disc can bulge or rupture and press on a nerve. However, a bulging or ruptured disc can occur without back pain. Disc disease is often found incidentally during spine X-rays given for another reason. 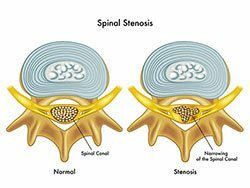 Spinal stenosis. Spinal stenosis is narrowing of spaces in the spine, causing pressure on the spinal cord and nerves that travel through the spine to the arms and legs. 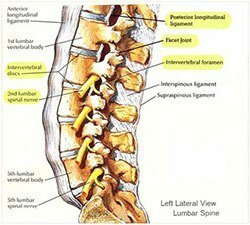 Most cases occur in the lumbar region of the back and are often caused by the wear and tear related to osteoarthritis. Skeletal irregularities. Back pain can occur if the spine curves abnormally. Scoliosis, a condition in which your spine curves to the side (laterally), also may lead to back pain, but generally only if the scoliosis is severe. View the following video to learn more about spinal anatomy. The most common causes of back pain that are not related to trauma are poor posture, excessive weight, poor workstation setup, lack of exercise, and limited flexibility. Most of these factors are preventable and treatable. Preventing back pain can be as simple as keeping it strong and flexible. Princeton University Athletic Medicine provides an excellent series of exercises for back pain. Remember to be aware of the difference between a good hurt and a bad hurt and to start gently. If in doubt, stop and consult your physician. For more information on treatments for back conditions please visit Our Services page.